A speech in Canary Wharf, East London, was the deputy Prime Minister’s opportunity to re-invigorate “green thinking” in the country. Green debate within government has certainly been curtailed since the Chris Huhne conference speech last year. Of course, the former Environment Minister resigned over an ongoing court case. 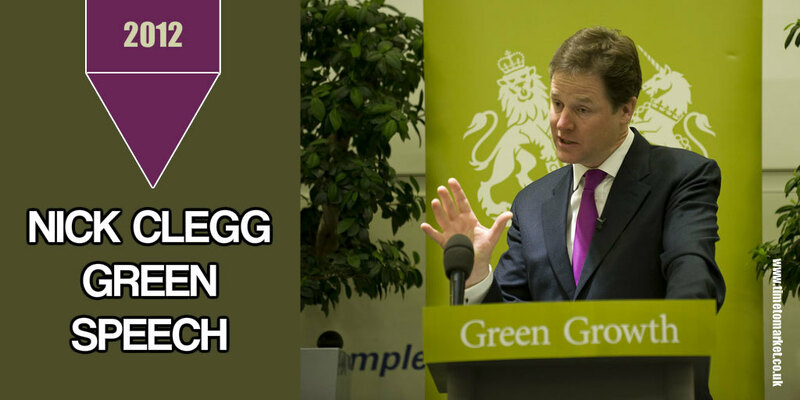 So this Nick Clegg green speech marked a new phase. Thus his wide-ranging speech sought to challenge the assumption that environmental concerns were a matter for a more vibrant economy. But this new wisdom, however widely held, is utterly wrong. Yes, right now climate change may be lower down some people’s thoughts. Yes, we need to be sensitive to businesses’ needs. But in so many ways, for so many consumers, for so many firms, going green has never made so much sense. He then used a contrasting technique for illustration. So, he illustrated that there’s more involved than just a simple decision between green or growth. Hence the theme for his speech…Green Growth. Certainly this was a central plank of the Prince Charles whistle stop speech tour 18 months ago. How can we relieve some of the pressure on hard-up households? By helping families use less energy to cut their bills. How can we re-balance our economy away from its over-reliance on the City of London? By capitalising on our competitive edge in green industries, generating jobs and wealth outside of London and the South East. How will we find the money needed to renew our infrastructure? By competing successfully in the global low carbon market, to attract billions of pounds worth of outside investment to the UK. And, as we make our way along this choppy recovery, how can we better shield bill payers from price shocks in oil and gas? By depending less on fossil fuels, by producing more clean energy ourselves. His 25 minute speech was crisply delivered at the KPMG offices to an appreciative audience of industrialists, green lobbyists and journalists. Concluding his speech involved, of course, a peroration that we have come to expect with Mr. Clegg’s speeches. Was this conclusion for his immediate audience? Or was it aimed at Liberal Democrats waiting for the next round of local elections? Who knows. This is a Coalition that has committed to halving greenhouse gas emissions by 2025, the boldest target set, in law, by any government, anywhere in the world. And we’ll be pressing our neighbours to set much more ambitious EU targets at talks in Denmark next week. A Coalition leading the biggest shake-up of the electricity market in thirty years. A Coalition creating the UK’s first ever market in energy efficiency through the Green Deal. A brisk repetition technique rounded off this speech by the deputy Prime Minister. Now, who’s next in line for a Green speech? George Osborne? Maybe, but we really doubt it. 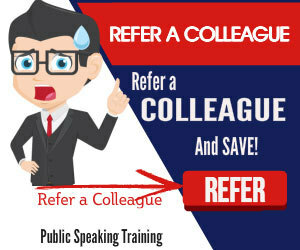 You can discover plenty of public speaking tips and techniques with our regular posts, podcasts and videos. And with more than 100 tips for you to browse, you are bound to find something to help you out. 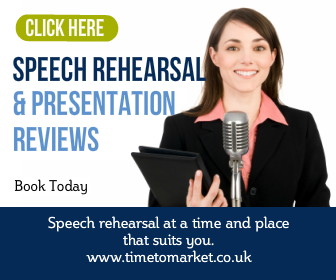 But, when you want even more focus on your own public speaking skills please don’t hesitate to get in touch about coaching or training. Tweedledems Speech. Clegg Late For An Important Date?